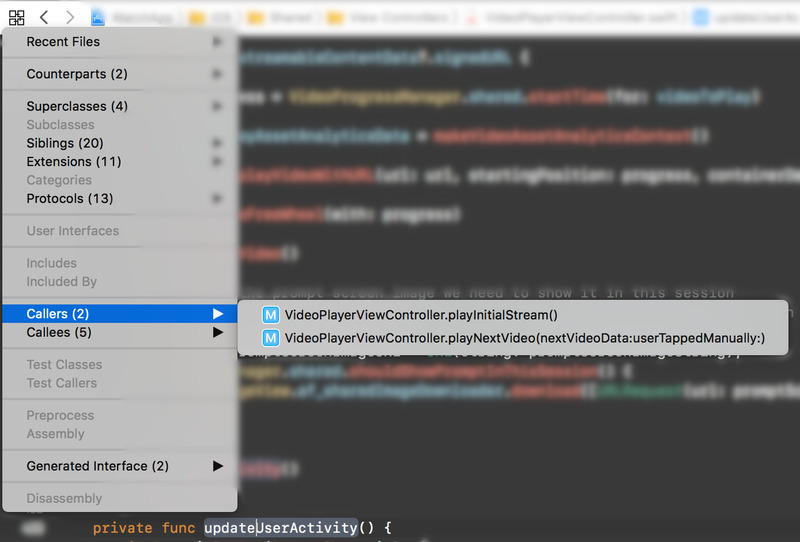 Recently I have been asked a few times, mostly by disgruntled ex-iOS Android developers, whether Xcode does anything more with the source code than just color-highlight it or allow to jump around the sources by using Jump to definition. One of the things people seemed to miss the most is the ability to find places which call the focused function, known as, among others, “Find calls” in other IDEs. It’s true that Xcode has always felt more like a text editor with a compiler than an IDE that provides a rich user interface on top of the source code, like Eclipse or IntelliJ’s tools, for example. Good news is, it does indeed have some cool code structure aware features hidden in the plain sight. This approach goes in line with Apple’s philosophy of a clean design that doesn’t overwhelm the user with available options. In case of a programming environment though, which is a specialized tool in hands of a perceptive and analytical user for several hours a day, such features could be perhaps a little more obviously visible. And so there is an extremely useful Related Items editor menu, by default available under a Ctrl-1 shortcut, that includes, among others, a Callers submenu. Yay! Of course, its contents become available once Xcode manages to index and process app’s source.